A dance performance that makes me want to go out and get my boogie on always boasts the audience leaving with smiles plastered on their faces. The Mix-Mix Dance Collective certainly brought in a mixed crowd but gave universal satisfaction. An elderly couple in front of me at the show commented “Well that worked out!” when the lights came up. Jack Your Body begins in a way that may seem familiar to modern dance audiences, with contemplative on-stage costume changes, and a spoken-word audio track. However, the opening piece is, essentially, a dance-off. Modeled after a 60’s vogue-ing competition, dancers strut their stuff, and the male dancers astound by working their bodies in 4-inch heels (minimum), including dramatic drops and jumping fan kicks. The creative minds behind Jack Your Body are considerate regarding the audience’s knowledge, or lack thereof, of 60’s and 70’s street dance. Vocal explanatory tracks did not hold our hand, but shed light on intimacies, ideologies, and impulses behind such styles as vogue, house, and funk. Individual solos allow the audience to follow a pattern, and the unison impresses with its, well, unison. Styles like house and funk that are so personal and individual can be difficult to translate or replicate in a group. The way one dancer moves a hip, arm, or wrist may be so delicately nuanced that others may find a similar representation difficult. 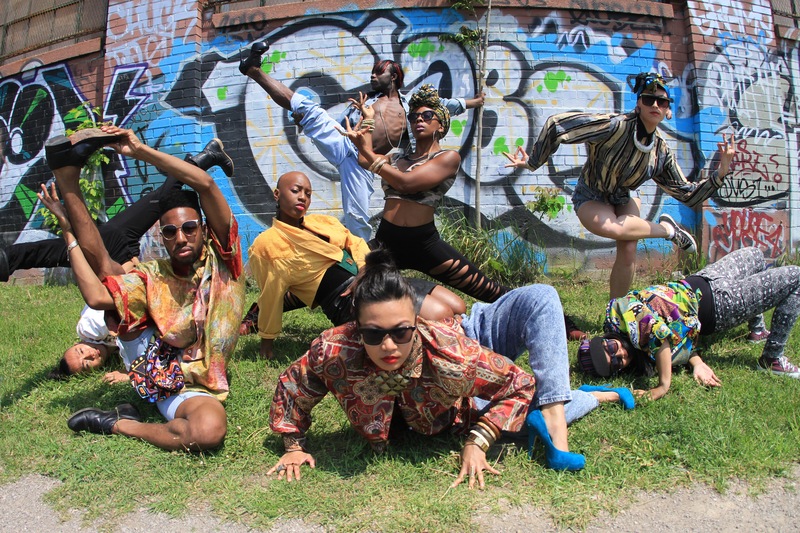 Now, this is a concern in all dance, but the styles the Mix-Mix Dance Collective performed are often so ingrained in the natural movement of a body and commonly stem from improvisation that it can be a challenge to set movements down into counts and choreography. Besides the intelligence of the show’s compilation, the dancers are outrageous. Their charisma and stage presence shine through, and each dancer’s presentation is something I always look for in dance performance. I am not at all interested in a permanent smile, but look for honesty of emotion. Every performer in Jack Your Body works and thrives on their personal experience on the stage, stony-faced when necessary, elated and jovial when called for. Perhaps it is this truthfulness and joy that I saw onstage that pulled me into the show. While the show may not seem entirely universal, appealing more to a younger crowd, the vivacity, dedication, and love shown onstage in Jack Your Body calls to every generation. While some moments throughout the performance do occasionally lag, the dancers manage to pull out more energy and regain momentum. A plug must also be made for the fabulous soundtrack to the show, many of everyone’s favourite funk and soul hits. In addition, I have rarely seen a show with such fantastic and accurate costuming. The backstage area must be reminiscent of Boxing Day madness post-performance from all the changes, but every clothing item works, is perfection. No outfit is too distracting, each bit necessary. I applaud Mix-Mix Dance Collective and all those involved in the production of Jack Your Body for allowing me to see the most entertaining, adventurous, silly, and wonderful show I have seen in ages. I strongly urge all Torontonians to get their butts down to the Randolph Theatre to see Jack Your Body in the Toronto Fringe festival this year. 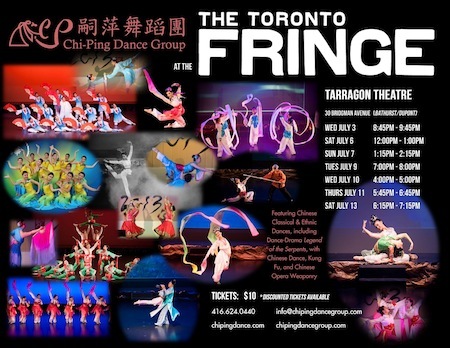 A Glance of Chinese Performing Arts is a lovely performance showing at the Tarragon Main Theatre during this year’s Fringe festival. It boasts a larger cast than other dance shows, and certainly a larger age range! Although not accurately documented, the performers are of all ages from about 6 to 26. Clearly a family and community event, the excitement and animation on the faces of all the dancers is wonderful to see and experience. As a group of girls trouped offstage on a Saturday afternoon, the audience received a jovial tongue-out funny face from one excited dancer. The show opens with a spectacular act, a duet of two women that envelops the entire stage. Their performance involves dancing with long strips of pastel silks and creating the most gorgeous and fluid shapes in the air and with their bodies. Picture in your mind rhythmic gymnastic ribbons, but add grace, class, beauty, and a little bit of magic. These women enthralled me with the shapes they make, manipulating the air, the fabric, and the negative space they create. Spirals, circles, and more shapes than I have names for appear only for a moment and are moved and remodeled into something new. The ribbons are an extension of their bodies, creating enormous figures onstage that are able to delicately sidestep each other and find perfect unison. For the rest of the show, an interesting historical journey is presented, with different national dances from a selection of diverse Chinese ethnic and indigenous groups. Having studied some central European national dances, I was interested to see something entirely new to me. However, much of the information gets lost as the narrator for each piece speaks from backstage and is often drowned out by the music. I felt privy to almost a private performance, as if I was viewing the final dance recital of a small dance school, such as the one I attended throughout my childhood. Some dancers shine and some fumble in the most endearing way, but every performer and parent is pleased and proud by the conclusion. Interspersed throughout the cultural dances of the younger children are numbers featuring the two performers from the opening act. Manipulation of fabric in a beautiful and artistic way develops as a trend, with silken fans that wave like water and open like flowers. The aesthetic beauty of the Chinese performing arts is evident, as is a cultural pride. By not being a parent or family friend of a performer, I did feel a little out of place in such a community event, but I was pleased to have taken part and, as always, see the blossoming love and talent that moves hand in hand with every budding dancer.